6 simple sentences for each of 25 different themes. 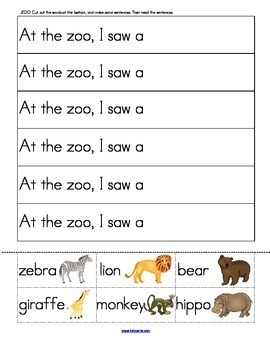 The sentences all begin similarly, for example “At the zoo I saw a …” The children cut and paste 6 labeled pictures of what might be seen at a zoo, to finish the sentence. 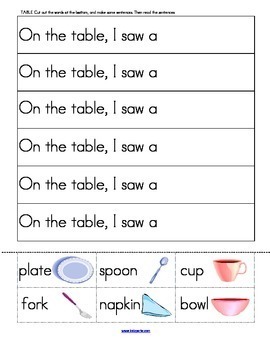 Because of the repetition at the beginning, and the picture clue at the end, the children are able to predict what the sentences say, and are able to “read” them. Encourages sight reading, word recognition, categorizing, understanding of word and sentence structure (capital letter, punctuation, spaces etc), cutting and pasting skills and self-confidence. The themes are: Zoo, park, sky, pet store, forest, birthday, garden, bathroom, table, fruit bowl, drawer, beach, school, summer, fall, winter, spring, pizza, home, store, farm, tree, road, tool box, and kitchen. 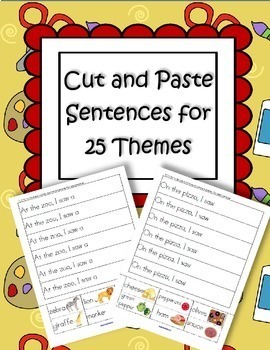 Also included in the bundle are: CUT and PASTE Numbers and Sets Match (1-12) for 25 Themes and CUT and PASTE Emergent Readers for 25 Themes.